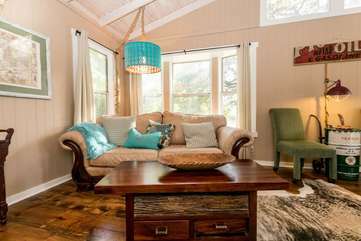 AMENITIES - Cable TV, DVD, Wi-Fi, private courtyard with outdoor fireplace (wood not provided) & hot tub. The slightly larger of the two, the Weston Suite entrance is located on the back side of the house where you’ll also find the romantic outdoor fireplace and sitting area. Just down the steps into the backyard is where the hot tub is located, perfectly tucked away for maximum privacy. Inside, you’ll find vaulted ceilings in the living area with a ton of windows allowing for plenty of natural light. It’s fashionably decorated with pops of turquoise and red as well as modern industrial and antiques alike. Although it’s very similar in style and amenities as it’s sister suite, the Weston offers the additional convenience of a full kitchen. Whether you try the Ava Suite or the Weston Suite first, we’re sure you’ll love the Courtyards on San Antonio so much you’ll be back to stay in the other. Wonderful relaxing place to enjoy the friendly town of Fredericksburg. All the amenities of home and close enough to restaurants and shopping. Great place!! Thoroughly enjoyed our stay. Close to everything, yet private and quiet. Fantastic location. Great decor and loved the fireplace and hot tub. We will be back again for another weekend getaway!! We were delighted upon pulling up and settling into this cozy but spacious spot for an escape from Austin weekend. We walked all over town, enjoyed the green country-like view from our porch and felt home immediately in this perfectly located spot. Everything we needed + thoughtful hospitality touches inside made our stay special. We celebrated 5 months since our wedding and love reading other reviews that describe an anniversary celebrated here as well! What a delightful romantic retreat for our 50th anniversary. The place itself has everything, including a luxurious bedroom, a cozy and bright living room, and the wonderful private hot tub just outside the door. Would love to go back there now that the weather is cool to try out the outdoor fireplace. We loved walking to the great restaurants and shops, and it was a super delight to visit the nearby Nimitz Museum. Would recommend it to couples, young and old, and any group looking for a relaxing and memorable weekend in the Hill Country’s hottest spot.